What is the "stoma" and what does stomatitis mean? A stoma is an opening. In cats, we refer to the stoma as the oral cavity or mouth. Stomatitis is a general term that refers to inflammation of the oral cavity! Gingivostomatitis is a term also used to describe this condition. What are signs or symptoms of stomatitis in cats? 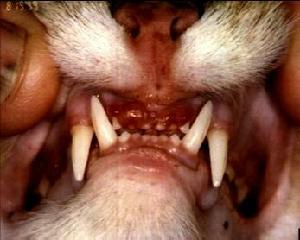 Many cats with stomatitis also have tooth resorption. The inflammed gingiva may appear to be growing into a tooth or the tooth may appear to have a hole. These are painful teeth. 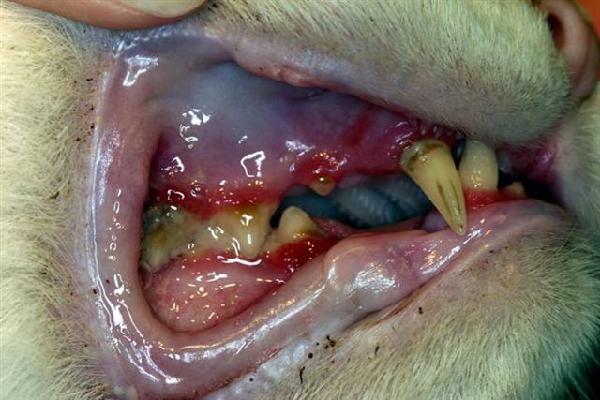 Juvenile Periodontitis in a young cat! Simba; 10 months after treatment. and professional care at 4 month intervals. Simba was fed T/D diet. Catrena's Left side. Severe Inflammation and very bad breath and not eating well. Catrena's right side. Her throat (oropharynx) was extremely inflamed and bleeding. What is faucitis? Caudal Mucositis? Faucitis is a term that has been used to describe inflammation of the tissues behind the teeth in the back of the oral cavity (see images below). Some veterinary dentists prefer the term "caudal stomatitis" or inflammation of the "lateral pharyngeal walls" or "caudal mucositis". Others call it stomatitis with faucitis. The fauces are the "lateral pharyngeal walls" (of the throat). This is a life threatening condition and these cats are frequently very painful, eating poorly and chronically loosing weight. They are often at risk of developing "fatty liver" or hepatic lipidosis from chronic malnutrition. What is LPGS or Lymphocytic Plasmacytic Stomatitis? When biopsies are taken of these inflamed oral tissues, the pathologist will often describe the condition as lymphocytic, plasmacytic gingivostomatitis. Lymphocytes and plasma cells are white blood cells commonly observed with severe inflammation. The condition is often abbreviated as LPGS. 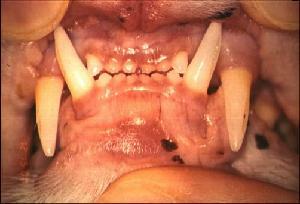 Sophia has severe stomatitis (the right upper dental arcade shown above). Sophia's stomatitis (view of the left upper dental arcade). Sophia's stomatitis (view of the upper incisor area). Sophia's lateral pharyngeal walls very swollen and painful. Notice that these inflamed tissues have folded "crypts" that allow bacteria and viruses to hide. This stimulates the immune system to propagate continued inflammation. Chronic inflammation is painful, reduces appetite and overall quality of life. 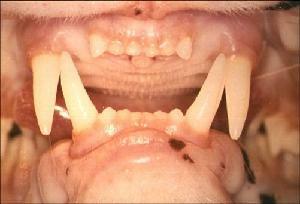 Ranger has severe stomatitis of the right upper and lower dental arcades (shown above). Ranger also has tooth resorption. How do we diagnose feline stomatitis? We do not need to spend a tremendous amount of time, effort or money to establish the diagnosis of stomatitis. The history of oral inflammation along with a thorough oral examination are typically enough to establish a working or preliminary diagnosis of stomatitis. A long duration of oral inflammation (chronic) with widespread location of tissues involved is typical of feline stomatitis. A short duration of oral inflammation may be the beginning of stomatitis or an entirely different disease. Allergies, foreign body irritation, periodontal disease or tooth resorption are all possibilities. Therefore an early, correct diagnosis is very important. If the inflammation is not widespread and is localized to a specific area, other diseases should be considered. Incisional or excisional biopsies help differentiate stomatitis from oral cancer or a localized infectious disease process. 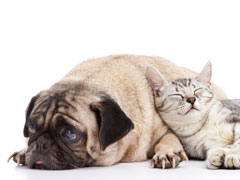 How do we treat feline stomatitis? 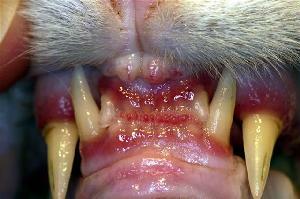 Treatment for feline stomatitis is dependent on the individual case. Stomatitis affects cats differently depending on the stage of stomatitis, the severity of disease and the individual cat's pain tolerance. The ability of the owner to provide home care (daily teeth brushing) is also a factor in treatment planning. Medical, surgical and combination therapy options are available. Medical therapy has provided short-term control for feline stomatitis; however, the long term results are extremely disappointing. Surgical therapy has offered remarkable immediate pain relief with long-term control of feline stomatitis. The surgical procedure involves meticulous dental extraction technique with wide excision of the inflamed mucogingival tissues. Dental radiography is absolutely essential in performing surgical extractions for these cats! Leaving root tips defeats the purpose of performing oral surgical treatment. Radiographs help remove these teeth completely. Failure to widely excise the inflamed tissue complicates the healing process. The inflamed soft tissues allow for bacteria and viruses to hide. This further stimulates the cat's immune system and propagates continued inflammation. Inflammation contributes to chronic (long-term) oral pain. Chronic oral pain is a shame because it reduces the quality of life. The surgical defect must be sutured closed using tension free mucogingival flaps. Failure to suture the surgical site closed allows for continued inflammation and the development of local bacterial infection. Osteomyelitis, a bone infection can be a serious surgical complication with tragic consequences. Some cases require combined surgical, medical and homeopathic therapies for long-term control of feline stomatitis. Sophia; intraoperative view of the lower jaw. Inflamed tissues were widely excised and meticulously sutured closed using 4-0 clear Monocryl. Sophia was anorexic for approximately ten days prior to surgical treatment for her stomatitis. She ate soft food four hours after oral surgery without assistance. Sophia is not an exceptional case with a remarkable recovery from surgical therapy for stomatitis. The majority of cats experience near immediate relief from their chronic (long-term) pain. Owners typically report that their cats are happier than they have been for months and even years after oral surgery for stomatitis. Most owners are amazed that their cats will go back to eating hard kibble even though they have few or no teeth. The transformation in the quality of the lives of cats treated surgically for stomatitis is personally and professionally rewarding! Feline stomatitis post surgical photos demonstrating wide debridement of the inflammed soft tissue and 4-0 Monocryl suture closure of the surgical defect. It cannot be over-emphasized that this is a major procedure absolutely requiring dental radiographs, appropriate training, time for meticulous operative technique, anesthesia monitoring and patient care.